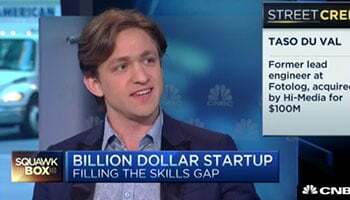 Hire the top 3% of freelance Salesforce developers. Toptal is a marketplace for top Salesforce developers, engineers, programmers, coders, architects, and consultants. Top companies and start-ups choose Toptal Salesforce freelancers for their mission-critical software projects. Salesforce is a cloud computing company, best known for its flagship Customer Relationship Management (CRM) system. In addition to its many out-of-the-box features, the Salesforce CRM solution offers a full-blown development environment that allows companies to customize and develop their solutions leveraging the Salesforce technologies in the cloud. This guide offers a sampling of insightful questions to help you identify the best Salesforce developers who are experts in their field. 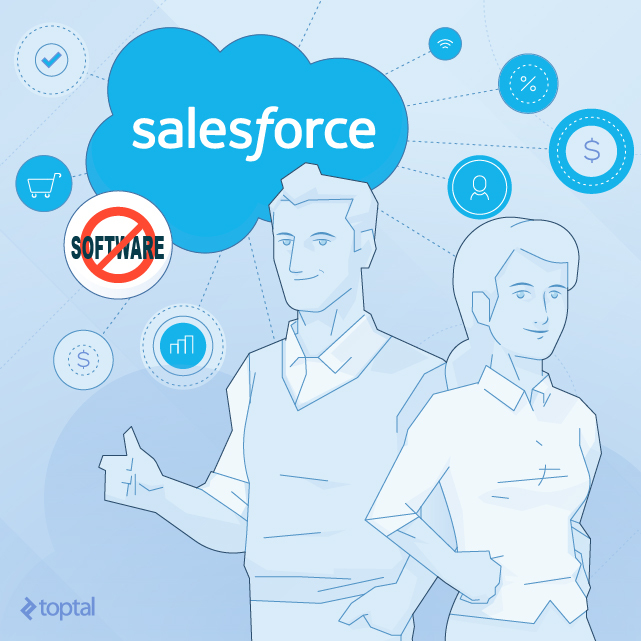 Toptal is a marketplace for top Salesforce developers, engineers, programmers, coders, architects, and consultants. Top companies and start-ups choose Toptal freelancers for their mission-critical software projects. Charles is a motivated senior Salesforce consultant and developer with over six years of experience, focused on finding new and creative ways of leveraging the Salesforce.com platform to address the ever-changing needs of business organizations. To top things off, he has a keen understanding of business and business concepts, which enables him to effectively communicate with executives and key business stakeholders. Uwe is an experienced software architect, developer, and IT consultant who specializes in cloud computing, on-demand CRM technology, Salesforce.com, online marketing, and web services. He is a creative and dedicated individual. Oleg has been working with the Salesforce platform since late 2007. During that time, he gained great expertise building enterprise-grade applications on it. His knowledge of Force.com tools, frameworks, and features includes Apex, Visualforce, Lightning/Aura, customer/partner communities, ProcessBuilder, Salesforce 1, and more. He is well versed in Scrum/Agile methodology and change management. Ajinkya is a senior Salesforce developer and architect and has worked on Salesforce Sales, Service, Community, and App Cloud. He is extremely knowledgeable about advanced Apex programming, integrations and Visualforce and Lightning development. He's managed many complex projects and led and facilitated onsite and offsite teams. Ajinkya's expertise is reflected in his past projects and also in his Salesforce Certifications. Matthew is a natural leader who loves to solve problems and take the initiative. He has excellent verbal and writing skills and two Master's degrees. He enjoys taking on tricky problems. Maria is a certified Salesforce.com developer and administrator with eight years of experience specializing in the design, development, implementation, and administration of efficient business solutions while providing a great user experience. She pays close attention to details and communicates extremely well. Sunny has more than six years of experience as an IT professional. He's committed to maintaining cutting-edge technical skills and up-to-date industry knowledge. He is a developer/administrator certified in Salesforce who also has expertise in Salesforce out-of-the-box functionalities (workflows, approval process, standard objects, standard applications). He has hands-on experience writing Apex classes/triggers, SOQL, SOSL, and Apex test methods. Abhinav is a Salesforce architect, seven-time Salesforce MVP (Most Valuable Professional), blogger, open source enthusiast, speaker for Salesforce and Dreamforce, and author of a Salesforce Book. He excels with Salesforce anything (customizations, integrations, advanced dev with Lightning, Visualforce, Apex, Communities, or AppExchange Apps), along with that stronghold in delivering sensible UX and solving business problems. Bohdan is a certified Salesforce developer and administrator with over seven years of experience developing and supporting Salesforce solutions. He currently holds the Salesforce Certified Force.com Developer and Certified Platform Developer I and II certifications. Pablo is a Salesforce certified platform developer specializing in back-end programming. He's always looking forward to optimizing his implementations. Pablo takes advantage of all of Salesforce's resources and is always ready to investigate and apply new technologies. In general, writing code is an essential part of extending any software, product, or platform. But when it comes to Salesforce, coding is not necessarily required. This is possible because Salesforce provides a comprehensive toolbox, including drag-and-drop tools to build your database, standard user interfaces (UIs) to edit with point-and-click tools, and workflow engines with advanced automation capabilities. By sticking to only these tools, it’s possible to a create an advanced and customized business solution inside Salesforce without writing a single line of code. This out-of-the-box toolkit will work for some, and for others an expert might be needed to get you to the finish line. This is when coding comes into play and when you’ll have to hire a developer to help you. With Salesforce, this out-of-the-box toolkit will work for some, and for others an expert might be needed to get you to the finish line. If you do need an expert-level Salesforce developer, you should seek someone who is not only fluent with SQL and Salesforce’s drag-and-drop tools, but someone who also knows Apex and SOQL, Salesforce’s custom programming and query language. Most people won’t know the right questions to ask, which is why we put together this guide. In it, you’ll find our top Salesforce developer interview questions and answers. Q: Name the available collection types in Apex. Discuss their limits and characteristics. In Salesforce, Apex supports three different collection types: Lists, Maps, and Sets. Lists are ordered collections of elements that are distinguished by their indices. Lists should be used when you want to identify an element by its index. It’s also important to note that lists can contain duplicates. Maps are collections of key-value pairs, where each unique key maps to a single value. A key can be any primitive data type, and value can be a primitive, sObject, collection type, or an Apex object. Sets are unordered collections of elements that do not contain any duplicates (in contrast to Lists, as noted above). Which type should you use? That depends on what you’re trying to accomplish and the characteristic of each collection type described above. It’s also worth mentioning that removing items from a set is more straightforward than removing an item from a list. When you remove an item from a list, the index will shift left. There is no inherent limit on the number of items a collection can hold, although there is an implicit limit based on the heap size. Due to the multi-tenant nature of the environment, Salesforce maintains a table with all the limits. Salesforce occasionally revises these limits and adjusts the execution capabilities. Q: Discuss the transaction control limitations in Apex. Salesforce is a multi-tenant environment, which essentially means that all resources are shared among its users. To maintain system performance and availability, the platform enforces process limits. All Salesforce developers must know these limits well because they affect how a solution should be engineered and coded. Here’s the most relevant limitations regarding transaction control. Static variables are not reverted during a RollBack. The ID on an sObject inserted after setting a SavePoint is not cleared after a RollBack. Each RollBack or SavePoint you set, counts against the governor limit for the DML statements. References to SavePoints cannot cross trigger invocations because each trigger invocation is a new trigger context. If you set more than one SavePoint, then roll back to a SavePoint that is not the last SavePoint you generated, the later SavePoint variables become invalid. Q: What is the time limit for synchronous Apex requests? Discuss the strategies that can be used to avoid hitting the limit. A synchronous Apex request that is running for more than five seconds is considered to be long-running. To avoid reaching this limit, it’s recommended to use any of the following strategies. Tune SOQL and DML operations, making sure queries are selective. Check if Batch Apex is a possible alternative to convert synchronous processes into asynchronous processes. Try to limit calls to synchronous web services. These are standard solutions Salesforce developers know to look out for when reaching limits. Limits are at the very core of Salesforce development, and every developer should understand them. When you get errors mentioning limits, you should tweak your code to optimize, or break your solution into chunks that will stay within the Salesforce enforced limits. Q: What is the main difference between a global and a public class in Apex? Explain with examples. Global classes are visible in any application or namespace, while public classes are only visible within a specific application or namespace. All classes using the public access modifier will be accessible only within your own application or namespace. Classes using the global access modifier are accessible by Apex everywhere. An example would be a class that allows an external application to invoke an Apex Web service to perform an action in Salesforce. Q: Explain how to write an Apex class that will take into consideration the sharing rules for the current user. Explain with examples. By default, Apex code runs in the system context, with access to all objects and fields object permissions. If you need to write a class that will take the current user sharing rules into consideration, you need to declare it with the with sharing keywords. This class will be executed with access in the system context, with access to all objects and fields. This class will enforce the sharing rules of the current user. When a class is declared without these access modifiers, the current sharing rules are used. By default, the class will not enforce sharing rules except if the sharing rules are acquired from a calling class. Q: Explain what Apex Unit Tests are. Discuss the deploy requirements for Apex code. Provide an example. Salesforce uses Apex Unit Tests, which are class methods that check if a piece of code is working properly. Note that the unit test methods take no arguments, commit no data to the database, and send no emails. Test methods must be defined in test classes that are annotated with @IsTest. To deploy your Apex code, Salesforce requires that all of the following criteria is satisfied. At least 75% of your Apex code must be covered by unit tests, and all of these tests must be completed successfully. Every trigger must have some test coverage. All classes and triggers must compile successfully. Here is an example of a basic structure of a test class. Q: Explain how to access archived and deleted records by using the SOQL statement? In Salesforce, a deleted record is not actually deleted. Instead, it is moved to a recycle bin. Every Salesforce user has access to the recycle bin, which is conceptually similar to the recycle bin in Windows or macOS. The same goes for archiving. Therefore, if a developer building a query wants to include the deleted and archived records in its result set, [s]he can use the ALL ROWS keywords in the SOQL statement. Q: Explain how to assure a process can update records, without the risk of other processes or users simultaneously updating the same records. SOQL supports the FOR UPDATE keywords. When included in the SOQL statement, they guarantee that no other process or user will be able to update the records concurrently. After the transaction handling the records is completed, the lock is released. Explain what, if anything, is wrong with it? The preceding code fetches all the opportunities in the Qualification stage. While the code snippet is correct, we are using the string literal directly, without a constant or a configuration. This coding practice could become a source of problems because there may be other classes using the same approach. For example, if we assume that we want to change the stage name from Qualification to Pending Review, this would take a certain amount of work to perform an impact analysis and incorporate the changes in the code. This situation could have been avoided with a constant or a configuration approach, and our query will look something like this, assuming we have created a constant. Why does this code generate a compilation error? In Apex, @future annotated methods cannot get sObjects as arguments, because the sObject might change between the time you call the method and the time it actually executes. In this particular scenario, a list of sObjects IDs should be used instead to perform a query for the most up-to-date records. Take the time to find a top Salesforce developer. The questions we covered in this article should be a piece of cake for any sufficiently experienced Salesforce developer; and therefore, should help you distinguish a wannabe Salesforce developer, who mostly uses only drag-and-drop tools, from a top-level developer, who is fluent in both SOQL and Apex. Taking the time to find the best candidates is well worth the effort, as they will undoubtedly will have a significant impact on your team’s productivity and bottom line. See also: Toptal’s growing, community-driven list of essential Salesforce interview questions.